Early in the morning, June 16th, Shaun, F&B and I headed out to DFW and caught a flight to O'Hare airport in Chicago. From there, we were escorted to Oak Brook and the McDonald's corporate campus. We met our hosts for the weekend and settled F&B in our rooms, where they immediately tore into the welcome gifts from the team. They certainly knew how to win my kids' hearts right off the back, F&B were thrilled to have new goodies to open and play with (can't say Shaun & I were disappointed either, everyone we met was amazingly nice). Shaun took F&B to the pool for a bit while I headed out to meet the rest of the corporate team and the other moms. An hour later, Shaun, the kids, and the rest of the families joined us for a larger meet & greet, followed by a BBQ. Ben hit it off with Ro & Ree (SalsainChina's twin girls) and Faith found a sweet little girl named Lauren to hang out with (her mom works for McDonald's and we saw them throughout the trip but more on that later). It was amazing & busy & so much fun! Since I can barely keep it all straight in my head, I'm just going to go with some of the highlights, which may or may not be in chronological order. Thursday morning, we opted for an early wake-up, took the kids down for breakfast at the hotel, and headed out for a family scavenger hunt on the campus. It's a seriously beautiful area, I miss living in the north! Tons of trees, a pretty lake in the middle of it, lots of walking trails. It reminded me of the corporate campuses by us, with more foliage. F&B had a blast on the scavenger hunt and we ran into several of the other families too. The weather was also a whole lot better in Dallas. The day before, our driver at O'Hare told us it was "so hot" there. It was maybe 80. We had just left nearly 100 degrees at 6am. 80 is downright balmy, just in case you are curious. ;o) Needless to say, we enjoyed a lovely morning outdoors that did not have to involve a pool. After we finshed scavenger hunting, we headed out to meet everyone for lunch at the local McDonald's, followed by a Q&A session with the President and 2 VPs of McDonald's USA. F&B ditched us to hang out with the other kids, so we had a nice grown-up conversation with SalsainChina & her husband and Bonggamom. I had a very lovely frozen orange smoothie thing that tasted like a creamsicle and F&B got Shrek watches in their Happy Meals which made their day. We'll just pretend that Ben can tell time, he thinks he can. Since they had a full child-care staff for our kids, F&B headed back to the hotel with the rest of the kids and some of the dads (Shaun wanted to stay and listen to the Q&A session). The Q&A session was so interesting. I absolutely love that the president and both of the VPs are women and moms. A lot of the concerns voiced by our group are concerns they share, including healthy choices for their kids. 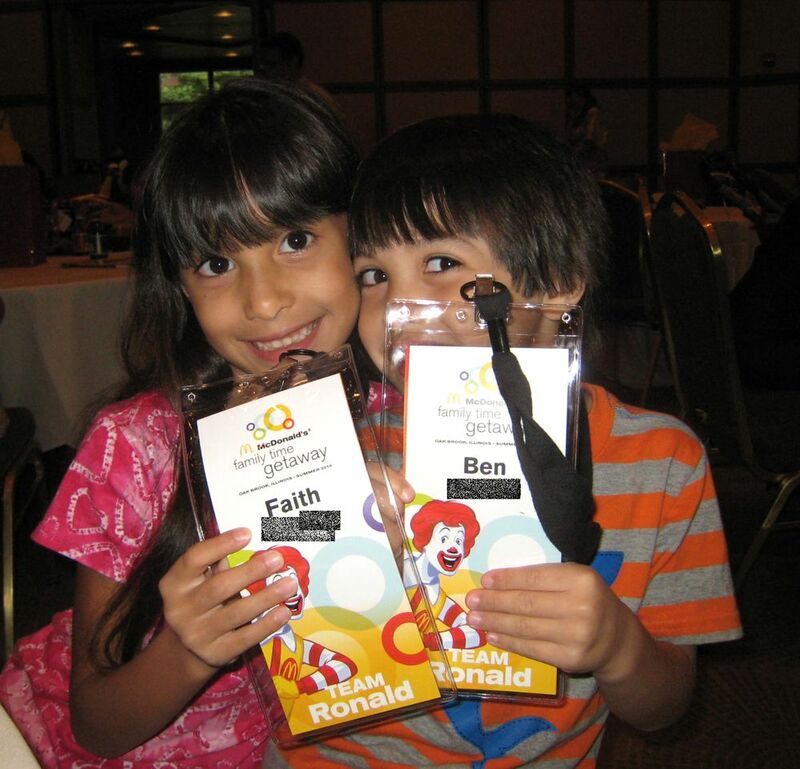 They shared their own stories, how they came to work for McDonald's, and about their families. The current president started out working in a restaurant herself, which I thought was amazing to hear. From their discussion, I found out that 40% of owners are either minorities or women and that the company spends over $5 billion/year with minority suppliers. They also talked about the company's commitment to their charities--Ronald McDonald House, how the owners/operators work with the charities, and their company volunteer program. They spent several hours with us answering questions on products, on healthier choices, kids' meals, toys, pretty much anything you could imagine to ask. We headed back to the corporate campus for another information session, this time with the marketing VPs and directors, talking about McDonald's commitment to children & families. They had out a display of Happy Meal toys over the years, which reminded me how, growing up in Canada, I always wanted the toys we saw on the commercials from the American stations that were never available in Canada. They did have out the very cool Halloween buckets. I did have one of those. They also talked about developing the play places and how around 4800 of their US restaurants now have them. Another growing up in Canada story for you. 25 years ago, Play Places weren't that common and the McDonald's in our town didn't have one. I always wanted to try one. And yes, I have, with F&B. The VP shared how they have chosen to market the Happy Meals now versus 20+ years ago, with milk, apple slices, and chicken nuggets (versus fries, soda & hamburger), which brings the meal under 400 calories. The apples are a 1/2 serving of fruit, which isn't a bad addition. They also showed us Happy Meals around the world and the offerings--kiwi in Italy, pineapple in France, corn in several Asian markets, cherry tomatoes in Brazil, grapes with the apples in (I think) Australia. However, in the US, the market doesn't support these options. I find that a rather interesting commentary on US nutrition as a whole. A restaurant is willing to provide a healthier option, test markets it and everything, but there is no demand for it? Sad. Plus, my kids would really love having pineapple as a choice. *I* would really like pineapple as a choice. They also introduced us to their 2 new fundraising programs--a portion of each Happy Meal & Mighty Kids Meal is going towards Ronald McDonald House Charities and a new online widget will be available soon which will also benefit RMHC. I'll share that as soon as I have a copy of it. In the morning, we went back to the corporate headquarters for a breakfast sensory experience. The sensory science part was really interesting. It's not just a matter of preparing food or the ingredients, but the taste, the texture, the appearance, the aroma and the sound food makes when you bit into it (think crispy apples). After explaining all of the information behind it, they brought out Egg McMuffins, McGriddles and Apple Dippers to eat as examples. Possibly the best Egg McMuffin I have ever eaten (obviously fresh off the grill)! I also discovered I loved the McGriddle Cakes, how can you go wrong with pockets of maple syrup right inside your pancake? F&B also enjoyed the whole crispy apple part and kept biting them to make them crunch. Breakfast was followed by a behind the counter tour of the corporate McDonald's restaurant. Faith decided to stay with us for this tour and Shaun pointed out all the things that were the same as when he worked at McDonald's in high school. The manager took us through their restaurant and showed us the (few) differences between the corporate one and stand alone restaurants, most of which had to do with being on the 3rd floor of a building. She showed us the process of making an Egg McMuffin (real Grade A eggs, cracked into a mold on the grill to make the cool round shape, I want a mold now!) and walked us through how they assemble the salads fresh daily in the restaurants. We also got to see the new espresso machines they use to make the coffee drinks, Shaun sampled one of those and loved it. This was followed by an introduction to creating new products and health concerns, including calorie issues, the process of creating the new Berry Smoothies and a focus group on the Fruit & Maple Oatmeal. The director of US nutrition walked us through creating a 600 calorie meal at McDonald's (not as hard as you might think) . Why 600? If a US diet is 2000 cal (for example), 600 is well within the range of acceptable for a meal. I found that many, many new products are tested, but few make the final menu cut. Customer demand is paramount and only those that will have the demand necessary make the menu. As well, planning is key. For the new fruit smoothies, we were told that their demand would have taken 1/3 of the US blackberry crop to create and put in restaurants, so the launch had to be preplanned by *years* to make sure enough berries were grown, as not to affect the rest of the market. They also had to contract fields in China a year in advance for enough edamame for Asian salads. The morning ended with Ben's highlight of the trip, cooking with "Chef Dan", McDonald's head chef. This was what he talked about all week, once we read him the agenda. 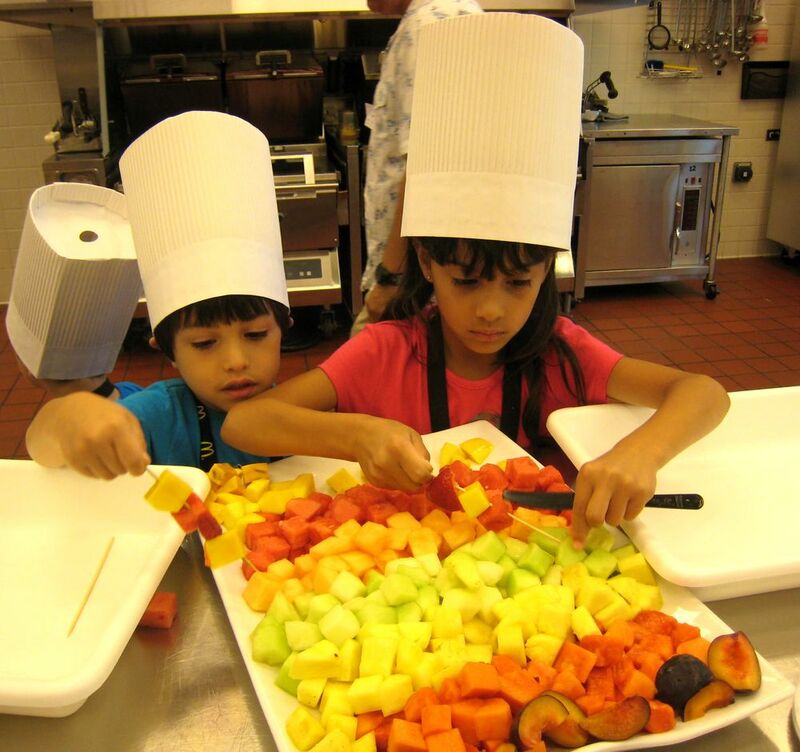 We went back to the test kitchens where the kids got to make fruit kebabs with yogurt dip in one kitchen and their own fresh fruit smoothie in the other kitchen. F&B absolutely love to help in the kitchen, so this was very impressive for both of them. Chef Dan was great with the kids, as were the two assistant chefs that helped out. And, of course, F&B never say no to fresh fruit. We finished our getaway with lunch and a wrap-up of the weekend, including a chance to talk one last time one-on-one or two-on-one with the team, to share with them what we learned, what our concerns as parents are, etc. The four of us had an amazing time and are so grateful to the team at McDonald's for showing us such wonderful hospitality. We haven't been away as a family for awhile and it was great to get to spend some quality time together. And there is still more fun! McDonald's is also offering a special prize pack for a lucky winner! Since the theme of the getaway weekend was "family time, happy time", it started my husband and I talking of some of the best things we've done together & with our kids. So, to enter, leave a comment telling me your favorite family memory (as a kid or as a grown-up). Or feel free to ask me a question about the trip or what we learned there, I'll answer as best I can! To get a second entry, blog or tweet this giveaway and leave a second comment below with that link. Each person may enter twice. It includes a Smile tote bag, $25 AMC gift card, a $20 McDonald's Arch card, a fleece blanket, frisbee, french fry playing cards, Monopoly Junior game, organic lip balm, vintage character t-shirt, stainless steel tumbler, and Happy Meal Toys (approximate retail value = $100). Meet the other wonderful bloggers I had the pleasure of meeting on this trip and enter the sweepstakes too. Well, I've always enjoyed McDonald's..I was even a swing manager there years ago...My fave item now is the fruit & yogurt parfait, although I did try the smoothie yesterday and it was very good! In recent memory, my favorite moment was when my daughter was born and my sons came in to the hospital room to meet her for the first time. My favorite childhood memory was getting rides around the neighborhood with my grandpa in his big white truck. My favorite McDonald's childhood memory was peeling all the breading off of the McNuggets before eating them, and then eating the breading last. Taking my parents to the first McDonalds in India! First off, your kids are adorable! Love your photos - looks like you had a great time. My favorite memories are all of the special trips and vacations that we went on. Whether it was to Washington DC, Boston, Hawaii, Disneyland, Disney World or beyond it was relaxing time with my brother and parents. loved family vacations to Florida every Thanksgiving! When we would travel from NC to FL every summer we would always stop of McDonalds halfway. IT was something to look forward to and a special treat. one of my favorite memories of my son is the way he says McDonald's. although it is his favorite place to eat, he pronounces it mic-a-donalds. not matter how many times people correct him, he continues to say it that way. i hope it NEVER goes away, very precious! My favorite family memory was when we had a bonfire night at my grandparents and toasted marshmallows over the fire. It was a lot of fun to be together. I follow your bentpo blog but never hopped over her til today! This is great that you got this amazing experience. My best memory with my parents is camping and eveytime I hear a zipper on a tent it takes me right back to that feeling. My hubby and I have been going on atleast one camping trip a year with the kids so they can have great memories also. This year we bought a whole new tent and gear....Love love camping! Favorite memories... I love when we go on trips as a family. My favorite is Coronado in Ca. Loved your review, lots of great info, and it looks like your family had a great time! A favorite memory of mine would have to be driving to AZ from TX this past Christmas to spend time with family. We lived in AZ when our daughter was born, so it was fun to show her the places we lived and went to when she was younger! my fav. chilhood memory is stopping at a specific mcd's on our way to and from our cousins house, 8 hrs north, two times a year (easter and thanksgiving). this one in PA had the best play place ever. Love all of the cute pictures! My favorite family memory is watching my oldest daughter (then two years old) old play soccer at an orphanage in Vietnam while we were picking up her new little sister. Such a wonderful, happy time! My biggest family memory was when my parents used to call a family meeting. It meant that Mom was going to have another baby. As the eldest of six children, I knew what was going to happen at a "family meeting." I used to joke with my parents that they should have stopped with perfection, but I would not have traded having two sisters, and three brothers for anything. Actually, a favorite childhood memory for me may sound a bit cliched but it was our family's first trip to Disney World when I was six and I got to walk hand and hand with Mickey Mouse in front of the castle. At age 30, I went back with my husband and then 6 year old and got to watch him experience that same wonder. My fav family memory is that three years ago I was lucky to win a grand prize via a sweepstakes. We got to go to Disneyland and to a Hannah Montana concert. The first nite at the park I stood at the parade and cried because it was dream to get my girls and hubby to enjoy the Disney experience. 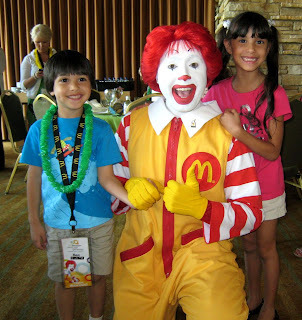 my favorite family memories are of vacationing at the beach - stopping at mcdonald's along the way of course! My favorite family memories are get together during holidays. My fav fam memory has to be the birth of my son. The minute I saw him, I saw my husband start to cry. It's not a vacation memory (altho I did hang in the hosp for 5 days) but it's the best memory EVER! my fave memory is my trip to vietnam 3 yrs ago to adopt my daughter-Hanoi will forever be a magical place in my heart. my family loves mcdonalds, my favorite item is the peanut butter cup mcflurry and the shamrock shake! my niece has her sons birthdays there every year and they love it. its hard to pull them away from playland. HOW COME THEY DONT SELL MCDONALDLAND COOKIES NO MORE, I LIKED THEM ALSO! My favorite family memories growing up were holidays with the whole family gathered together. Loving and fighting I miss so much. So many of them are no longer with us and I wish my kids could have had that...now I need to make it for them. My favorite memory with my family is going camping. It was such a simpler time. 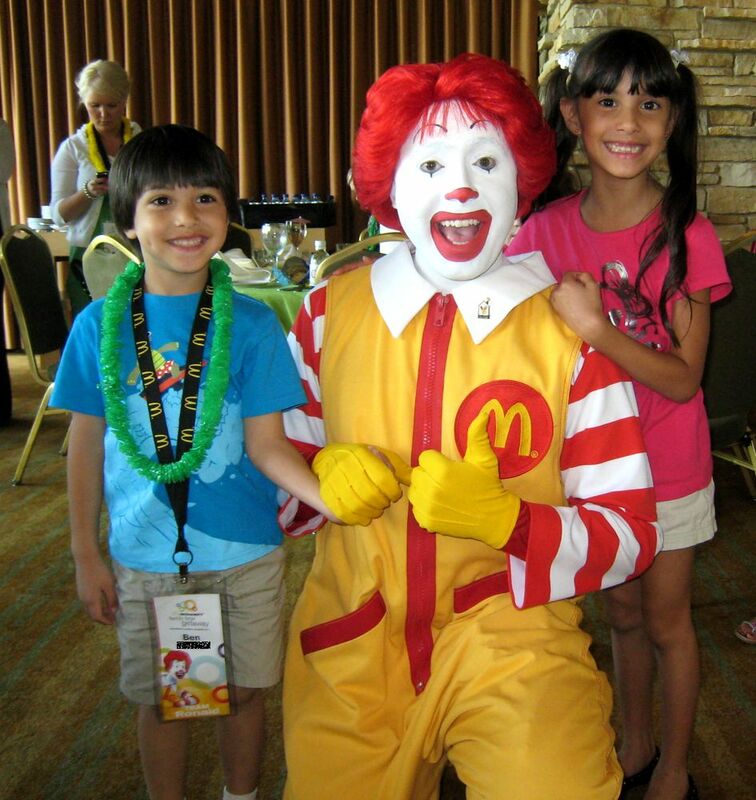 My favorite McDonals's memory is when I had my birthday party there as a kid. That was such a HUGE ordeal for us - I was the envy of the neighborhood! We loved to go on vacations as a family but my favorite memory was the time we spent in Wyoming! It was beautiful. One of my favorite family memories would have to be going to our membership sportsman's club for picnics, fishing and play. Not only was the place a secluded private wonderland, but the road to it was like a roller coaster and would literally make your tummy drop! Looks like a fun trip! I love what McDonald's does for families in need. My favorite fun thing with my family was last year when we went to the lake. We had such a blast watching the kids and swimming with them. It was truly great to not have to worry about the hustle and bustle of real life even if just for a few days. My favorite family memories growing up was when we'd get together with aunts, uncles & cousins at my grandma's house. We all squeezed in her tiny house and couldn't be happier. My favorite family memory was going to the cabin by the lake and waking up before the sun to go fishing with my Dad. 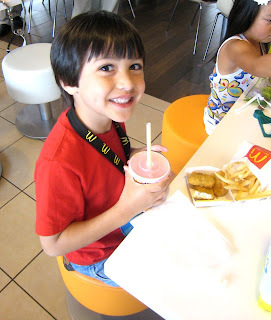 When I was little, I loved to get happy meals and the toys. one of mine is of long beach vacations - I was 14 when I first had McDonalds when they came to Australia! I loved spending the summers as a kid with my mom. she'd babysit so she was always home with us and the rest of the bunch. we'd go swimming at a family members or hang at the park. My favorite family memory is our son's first trip to Disneyland. It was so fun, and I almost cried as I watched how excited my son was! My favorite family times are at the beach. I love the sound of the ocean, watching the kids play in the ocean, and having some down time with my husband. Always, we love finding unique places to visit. During our travel time we try to manage to find a McDonald's for a scrumptious breakfast sandwich-yum!! My favorite family trip memory is when we went from KY to ND. We stopped at some neat places on the way, including a hotel with an indoor water park and a store with an indoor ferris wheel and then we stopped at the Mall of America on the way back. We all still talk about how much fun we had. Well, my kids are BIG now. Oldest is in college and the other two in high school (where I work). We just returned home from a camping trip and then a day at a waterpark. It is great fun being with your "nearly" grown kids. Even more that they WANT to still hang out with us! We also LOVE McDonald's! It's our favorite! My favorite memories are camping with my sons when they were Cub Scouts. We had the absolute best times! Both of my sons have gone on to become Eagle Scouts and I am very proud of them both! On of my favorite memories was going camping at yellowstone park when i was a kid. My favorite family memory as a kid was going to my grandpas house on the beach. To this day, when it is hot and really windy I am reminded of swimming in Lake Superior with my cousins while grandpa watched to make sure we were OK. Good times. My favorite family memory of going to McDonald's was going with grandma and grandpa to our local McDonald's. We always knew that a trip to grandma and grandpa's met McDonalds and playing outside in their play area. They had slides, a hamburglar lookout post area, fry guy riders that you could ride like a horse and a grimace statue you could sit on...I loved going there and still wish they had that playground! Best memory at McDonald's was having a birthday party there with the whole family. My most recent favorite family moment was going with my husband and kids to a waterpark for father's day - we had a lovely time together! Fav memory is eating lasagna and garlic bread for dinner. Mine was the trip we took up to Canada, all the way east to PEI, down to Washington, D.C. and then back across home to Colorado. Thanks for the contest. My family would go get takeout every friday night. My favorite family member so far has been the birth of my son - my husband was an awesome doula!